I received a letter from ConEdison today asking me if I'd like to switch over to wind energy. Wind energy is 100% pollution-free, fuel-free. ConEdison Solutions is leading the way in promoting pollution-free electricity by offering WIND and GREEN Power - clean, 100% renewable power. Instead of drawing on traditional power sources, such as nuclear power and fossil fuel sources, GREEN Power is generated from regional wind and low-impact hydropower sources. GREEN Power is composed of 65% run-of-the-river hydro and 35% wind power. 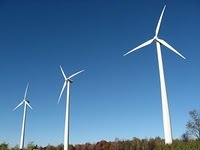 WIND Power is composed of electricity exclusively generated from 100% wind power. The benefit of clean energy is that it produces none of the detrimental environmental effects associated with electricity production that results in air emissions. Switching over will cost me about $10 a month extra, but that's a small price to pay for the environment. I'm doing it! Check with your electricity provider to see if green energy is available in your area. UPDATE: I'm all signed up!